Back Row: Ackie Ross (Millcraig), Richard Geddes, Murdo Murray, Dune MacDonald, Colin Ross (Saltburn), ?, Ronnie Fraser. Middle Row: Willie Ross (Decko), Ackie Urquhart (Saltburn), Andrew Shivas, Jack Rhind, Dave McCulloch, George Munro (Alness), Bobby Speed, Arthur Riach, Hugh Morrison, Sandy MacLennan, Paul Calder, Dune Urquhart, Ali Mitchell (Alness), Jocky Duff, Davie Ross, Andrew Fraser, Roddie MacDonald. Front Row: Jonny Shivas, Colin Urquhart, Sgt. Kenny Ross, Capt. McBeath, Reid Ross, Davie Beaumont, Willie Pirie. Murdo Murray in the back row was my Great Uncle. After the war he settled in Glasgow. He had 4 brothers and 3 sisters. Duncan, Willie (my Father-in-Law from my first marriage), Eckie, Donnie, Mary, Cath (my Gran) and Bella. Truly amazing! Richard Geddes was my cousin but I never met him (and never seen a picture of him) as he died before I was born. He was trapped in France with the Highland Division when the rest of the British Army was evacuated from Dunkirk. Most of the Division was captured at St. Valery in Normandy. Richard was killed on June the 6th 1940 near Abbeville in a futile attempt to take the town back from the advancing German army. I visited his grave last year and felt great sorrow for the loss of a relative I never knew. He was always talked about in family conversations and seemed to be a very popular person. The story of why the Highlanders did not get away from Dunkirk is thought to have been due to Churchill putting them under the command of the French Generals to give them the (false) impression that the British Army would stay to fight the Germans. The Seaforths were disbanded sometime in the ’60s. They wore the MacKenzie tartan and were based at Fort George. I guess many of the soldiers in this picture were killed or became prisoners in Polish salt mines. My uncle also served with the Seaforths, but is not listed above. Can anyone please confirm if this is the 4th Btn? His name was James (known as Jimmy) Fletcher. He died on 4th June 1940, also near Abbeville, and we have no photographs of him either. If I could only find out if he is in this photo it would be brilliant! - and I can show my mum. Name is spelt wrong - should be Maclellan not Maclennan. Sitting second from the left in the front row is my uncle Colin Urquhart, who still lives in Gordon Terrace, Invergordon, with his wife Dot and son Ross. Well it's a small world John! (see my entry of December 24 2004). For several years my family lived next door to your Uncle and Aunt in Gordon Terrace. I hope they are well and could you pass on my best regards? I never knew Colin was an army comrade of my cousin - I wonder if my Mother and father knew this? I remember Colin had a lucky escape in the early 50s when he worked for Balfour Beatty at one of the Hydro dams. The truck taking workmen to the site one morning was crushed by a falling telegraph pole just outside Dingwall and I believe there were fatalities. It was nice to hear from you Billy. This site is very interesting. I did not realise that Colin worked at the Hydro dams. If I can find out anymore about this picture I will let you know. Billy, still remember the skiffle band at the back of your house in Gordon Terrace. John, if we had only tried harder! I must have been one of the few kids in the Highlands with access to a guitar in the mid fifties. I was rubbish then and still can't play competently! WE COULD HAVE BEEN STARS!!!! In reply to Lorna who posted an earlier message - I have just posted a picture of the grave of Richard Geddes and I notice I got the date of his death wrong as Richard's gravestone states June 4th. I guess he was killed in the same action as your uncle. I don't know if they were in the 4th battalion but this info should be easily obtained from the Seaforth Museum at Fort George. Yes it should be Sandy Maclellan not Maclennan.........middle row 10th from left. Thanks for the info Bill (only just found the message as I have changed my email address). I cannot find the picture you mentioned - is it in France? (My Uncle doesn't have a grave). Thanks Bill, I had done some digging on the internet and knew his service number and a bit about the various battles and that he never made it to Dunkirk, although his name is there (cwgc website) and it is also on the memorial in Dingwall. I have a few books I'd like to buy when I get time to read them which should tell me a bit more about the situation: Saul David's "Churchill's Sacrifice of the 51st highland Division" and Jim Stockman's "Seaforth Highlanders 1939-45, a Fighting Soldier Remembers". Can you reccommend any others? I also have a copy of his death certificate, but that doesn't tell me anymore than I already know. Thanks again. Kind regards, Lorna. Hello Lorna, it is disappointing to hear that the Museum have not helped. I have had a look on the Web and I can confirm that your Uncle was in the 4th Battalion of the Seaforths. His service number was 2822820--My cousin was in the 4th also but a year older than James when he was killed. My cousin is buried in the small Mareuil-Caubert cemetary on the D3 just 6 miles South of Abbeville. There are 65 graves here and about 25 of the bodies were not identified ie "unknown". I guess there is a strong possibilty that one of these is your uncle given that he was in the same unit and died on the same day as my cousin. It is a lovely little spot, very peacefull and well kept. The action they were involved in was a hopeless attempt to seize Abbevillle back from the Germans. It failed partly because they were part of a mixed group involving French troops and there was very poor co-ordination during their attack. (One of the leading French officers was Colonel de Gaulle who of course eventually became President of France. I have heard of the books you list but I have not read them. The first one is fairly recent and got good reviews. I have a book written by Eric Linklater in 1942 "The Highland Division" - this was an official history of the 1940 campaign. "Return to St Valery" by Derek Lang was published in 1974 and records the memories of a Cameron Highlander who escaped and returned home (via Syria! ).There is also an illustrated booklet published in 1990 by the 51st HD officers Dining Club! It was produced to commemorate the fiftieth anniversary of the HD defeat. I would try to get Saul David�s book if I were you, as it is a comprehensive report on the campaign including the politics behind the events and why the Highlanders were not taken off at Dunkirk. It�s on my list and you have now reminded me to get it - thanks. Bill. G.
Bill, the Seaforth Highlanders were not disbanded; they were amalgamated with the Cameron Hldrs and became the Queens Own Highlanders. Thanks Bill. I had heard of Eric Linklater's book but had forgotten about it. I'll have a look online later and see if I can get copies of some of these books. Jocky Duff was my stepfather - he died in 1992 of Parkinson’s Disease. He was caught at Dunkirk and walked to Germany - PoW for the rest of the war. All he would say about that was they were treated much better than the Poles. He is buried at Kincardine cemetery, Ardgay. Always fondly remembered. Name is spelt wrong - should be MacCulloch not McCulloch. Does anyone remember my great uncle L/Sgt Thomas Crawford McMillan who was killed in 1944 at Monte Cassino? Anyone who does or has any old pictures or stories I would love to hear from you. May they all rest in peace with our thoughts and prayers. Andrew Fraser (known as Baldy), second from right middle row, was my uncle. He came from a large family living in Alness. I have a later photo of him taken when he was POW in Stalag V111B which I will post on site. As I have just stumbled on this great site I am spending a lot of time trawling through everything first and enjoying every minute of it. My "great uncle" Davie Ross is 3rd right on the second row. I am priviledged to have such a wonderful man in my life full of stories from the past which keeps my family history alive! My dad is Hamish (Jimmy, Skipper) Ross and he is the nephew of Davie and thankfully/gratefully they are still very close and hopefully this helps each other deal with the every day things that life throws at you! I love hearing stories from the past and want to know everything about my relatives that have sadly left this lfe. I know that I will never have or indure (thankfully) the experiences these men have had to deal with in their life time! Hello everybody, I have just recently discovered this site and am so happy to have done so. My name is Susi and my dad is Davie Beaumont seated second from the right. He will be 86 at the end of this month and still very fit and active. If anyone knows of my dad and has stories to tell I'd love to hear them. Colin Urquhart (front row) is my Dad. He is now 87 and still living in Gordon Terrace, Invergordon with my Mam, Dot and brother, Ross. He is completely blind now but keeping pretty well otherwise. Still good pals with Davie Ross and still speaks about Bobby Speed, and others no longer with us. Talks from time to time about his wartime days - he too was a prisoner in Stallag VIIIB. Re the Speed family: I thought they were from Saltburn. Can remember they used to live on the right hand side near the Invergordon end of Saltburn. My Mother was very friendly with Ma Speed when we lived in Saltburn. I met one of the Speed girls in Plymouth, but only briefly. Think she was married to a serviceman. My Great Uncle, Sgt Kenny Ross, is 3rd from left on front row - died 11th June 1940 of war wounds at Gosport Military Hospital, Southampton - was awarded the Military Medal posthumously. I held his medal in 2001 - he was my Grandmother's brother. I'm also trying to find out about his Brother Donald Ross - died 1947 age 43. He was a warrent officer in RAF - buried at Kilmuir Easter. There are numerous Seaforth memorials dotted all over French battlefields but in memory of individuals. I do not know of one specific to the Seaforths. At St Valery (WW2) there is a monument on the cliff above town commemorating all the Highland regiments who fought there. Likewise at Beamont Hamel (WW1) there is a fine memorial to the Highlanders who fought there. If you find a general memorial to the Seaforths, let me know and I will visit and photograph for posting on this site. Hi. Thanks for your reply. We found a memorial to the Seaforth Highlanders today at a place called Sunken Road Cemetry near Fampoux not far from Arras. I took a couple of still photos of the monument, but this has my Mum standing in front wearing her father's medal and medical discharge badge. We had a very moving day visiting relatives who came to France in WW1 and never went home. Thanks and god bless all those who keep the memories of those who fell alive. My uncle was Arthur Riach in the picture above. He was my father's eldest brother. He was killed on the 4th June 1940. I think it must have been in the same incident as Richard Geddes above. His body is buried in Arques-La-Bataille Communal Cemetry. Row C Grave 1. His service number was 2820991 Rank Corporal Arthur Scott Riach Aged 26. I have not yet benn able to visit the cemetry but now I am retired I will make the effort in the future. I am researaching the history of Morrison Construction, founded by Alex Morrison of Tain in 1948. Born in 1921, he worked as a joiner before the war, was in the T.A. and joined the Seaforthers at the outbreak. He spent most of the war as a POW in Poland (I don't know which camp) from 1940 to `45, having been captured at St Valery. I believe that another joiner from the Tain area, Jackie Marshall, was taken with him. If anybody has any recollections of either man, or of the POW camp, I'd be very pleased to hear. My information so far is pretty sketchy. My name is Alan Wilkinson, and I am available by email, also by telephone on 01904 629 627. I am working for Alex's son Gordon on this project. Alan, if Morrison Construction was in Tain, suggest you may have better luck on the Tain Museum Image Library? Alan, I found a picture of Alex Morrison on the Tain Museum image library and sent it to you via email. If you do not get it, go onto the Tain museum image site and search businesses, it is on about the 4th page. The picture number is 346. 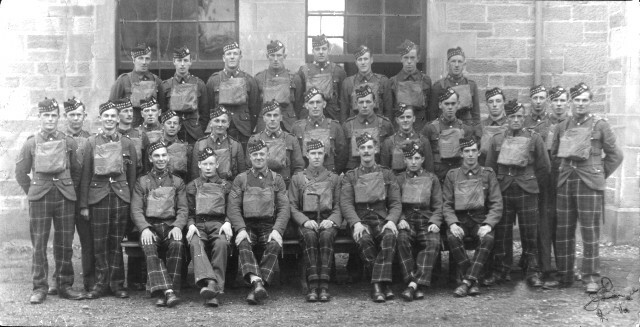 Back row 5th from left is Robert (Jack) Adam late of 10 Gordon Terrace Invergordon. Captured at St Valery and spent the duration of the war as a prisoner working in the Polish salt mines. After demob worked at Invergordon Dockyard as watchman and latterly as crew member on pilot boat. Alan, I remember Forbie Urquhart telling me that when he came back from Canada in the early 50s to run a shop in Tain High Street he got Alex Morrison to do it up for him. Alex brought some new fangled stuff called plasterboard up from his yard at the bottom of Castle Brae balanced on the pedal of his bike. Changed times! Also, the shop was painted with another new product - emulsion - which gave off such lethal fumes that by 9.30am the decorators were lying out on the pavement to recover! Amazing to see a photograph (the only one I've ever seen) of my father Ackie Ross (Millcraig) when he was in the army. I'm seeing faces to names he used to talk about. Like many others from this picture, he was captured at St Valery and ended up at Stalag VIIIB (I'm pretty sure I've seen a postcard from there...would that be right?) Dad died some 25 years ago. Very interesting site! I’m having trouble finding any information on my Grandfather. He was Hugh Murray of the Seaforth Highlanders. He fought in the battle of Somme and Ypres. He survived, and much later settled in new Zealand where he died at the age of 85. I've just came across this site while doing some research on the Seaforths 5th batallion WW2, buried in Reichswald Forrest war cemetery (Germany). Just came across Sergeant David Mackay RAFVR 578 SQ Age 19, service no. 1823109, from Invergordon, son of David and Helen Mackay. I would be grateful if anyone has any information on him or the whereabouts of family. Also, my uncle, Private John Macleod from Scourie (SUTHERLAND) age23, 5th battalion Seaforths service no. 2829132 died 11 Feb 1945 and also buried in Reichswald Forest. Living in France, I would be very grateful for any info on these two soldiers. My father served with the 5bn Seaforth Highlanders under a Capt. Alexander Grant (also known as George?) Murray. My father Tony Buxey (aka "Buck") was given his hip flask to drink from in trenches near Courseulles(?) but Capt Murray was killed by the time he had his nip and wanted to return it. Does anyone know of an A. G. Murray or his relatives as dad would like to return that hip flask? From what I can find out D.O.D. was 8/8/44 and he was possibly buried at Ranville Cemetery. Sorry that this enquiry is not about this picture. However, my father, Thomas Walter Lawrence, enlisted in the Seaforths about 1919- 1920, I imagine, as quite a young man (don't know his age) before transferring to the Royal Engineers. He served in India - I have photograph. Can anyone help me obtain information - service records - anything about him as a Seaforth Highlander? Thank you. My father was in the Seaforths a few days after D Day. His name was Frederick Pearce. Any info/pics would be much appreciated. I am looking for any infomation about my grandfather John Pinder who served in India around 1919-1932. I know this is a long shot but I would be very interested in any info about the regiment at this time. Thanks Shirley Sutcliffe nee Pinder. You may want to try the Regimental Museum at Fort George or the websites mentioned above. The Cabar Feidh website will give you the up to date address for the museum. Good Luck! My dad was in the Seaforth Highlanders. I'm not quiet sure what the dates were exactly but I think around 1947ish. His name was Derrick Edward Armstrong, born July 9th 1927. If anyone has any memories or pictures of him I would be truly grateful. His very proud daughter Linda Thomas (Armstrong). My grandfather on my Dad's side, George William Potter from Liverpool, was in the 6th Battalion Seaforth Highlanders. He enlisted on 6-12-1915 and was medically discharged on 16-10-1917 under Army Order 265 of 1917 para 2b1. I have a copy of his medal card but would like more info if anyone can help? What battles in France was he involved in? How he was injured? Any other documentation that may be available? I am looking for information on Robert Watt 2823024 from the Seaforth Highlanders, 2nd World War. Can anyone help? I am looking for any information on Cpl. Angus Jack 4th Seaforths No. 1379, I think C Company (Munlochy). I have a photograph of his brother Alex Jack, but have never seen one of my father in uniform. I am wondering if anyone knew my uncle Lance Sgt Thomas (TC) MacMillan. He was killed in Monte Cassino with the 6th Seaforth Highlanders. Would love to know more about this wonderful man. My father joined the Seaforths in 1939, as a private, and rose through the ranks to become a Captain. He never discussed the war, even though after leaving the Seaforths he joined the TA paratroops until 1957. I believe he was in Normandy for 1 month in 1944, may have been wounded. He returned for 4 months in 1946. Any information/pictures on him would be appreciated. John Hughes Adam, was his name. If you try the Dingwall Museum, I think they hold records and information on the Seaforths. They are, however, currently closed for the winter! Hello, I am really interested in the picture as I am putting together a book on the people from the parish of Gairloch who served in WW2. I wonder, did any of the men above come from that parish? Can anyone tell me about my father William Bell Keddie or Bill as he was known. He has recently passed away. He was in the Seaforth Highlanders for approx 2 years and then immigrated to Australia. I would say that he was there in 1954/53. He was very proud and I would like some info before his funeral on Friday the 24th July. Please if you knew him then let me know. Hello, has anyone any information on my grandfather Sandy Pringle from Cromartie? He was killed at St Valerey. Absolutely amazed at some of the stories my cousin Richard who was killed, Colin whom I lived next door to, with Dot Elizabeth, Ross, Donald and Morag. I loved Dot's herring in oatmeal. I do hope they are all well. Hi Jeanette, just to let you know that my uncle Colin died earlier this year. Dot and Ross still stay at the family home in Gordon Terrace, and they are the only original tenants left in Gordon Terrace. Elizabeth is married and lives in Inverness, Morag is married and lives in Ellon, and Donald is married and lives in Edinburgh. Hi John, that is sad, I wish I had visited them when I was up 2 years ago. I never dreamt they still lived in the same house, brings back a lot of happy memories. Hope you and the family are all well. Thanks John for letting me know. Hi Jeanette, Colin Ross Urquhart Jr, here - got Florence in with us, saw letter on web, please get in touch. Love from mam. Still at 21 Gordon Terrace, Invergordon, telephone 01349 852676. Hi Ross, got your message, will ring you. Lovely to hear from you, thank you. Hi, I am Andrew Ian MacDonald, son of Roddy MacDonald in the picture - would love any info on him, or any suggested books. All I can say is that I worked with Roddy, around 1967, in the Dockyard, Invergordon, with the Ministry of Works, and shared a dram - a great man, proud to have known him. All I can say Andrew is, your father was a good man, a quiet man, but when he spoke it was right and I always enjoyed working with him. Further to my comment on 3 May 2008, at long last I have managed to reunite the hip flask given to my father while he was repairing a Brenn Gun carrier for Capt Grant Murray, his commanding officer. Another contributor to this site, Duncan Robertson contacted me via email. All the details concerning Capt. Murray's sad death but valiant death concurred with my father's recollection. Following a Skype call with my elderly father, Anthony (Tony) Buxey and relatives of Capt. Murray, the hip flask in question was handed to his grand niece (?) who took possession of this memento in Australia at the end of January this year (2013). I can truly say that this was a long awaited wish which was finally fulfilled. My father held Capt. Murray in high esteem as a good soldier and someone who always had time for his men. Colin Ross (Saltburn) was my uncle. Colin Ross was my Grandfather. Both grandparents passed now but so lovely to see his picture and comments. My uncle Colin Ross from Primrose Cottage, Saltburn, was never married. Apologies. My mistake. I meant Colin Urquhart, front row. I'd like to know if the Ronnie Fraser pictured was from Ardross and/or Greenlands Farm, Arabella. I think it's my Grandad but I'm not sure as I thought Grandad was in the reserves as he was a farmer. Yes that is your Granda Ronnie, my father Finlay's brother, Ronnie was in the Seaforth Highlanders. Mairi, amazing what you find out. Could you email me. I realised that I know quite a lot about my family on Dad's side, but next to nothing about Grandad's side of the family. Except that my Uncle James REALLY looks like Grandad. So did Grandad go to France too? Your email address doesn't show on the website - if you don't mind giving it to me through this website I can forward you a copy of the Fraser book dating back to 1787; it gives you the full Fraser History and even includes you. Thanks for the tip, (you learn something new everyday). Hi, my dad Davie Beaumont seated 2nd from the right will be 94 in a few months - does anyone know him? Susi I would be most grateful if you could ask your Dad if he knows anything about how Richard Geddes died on June 4th 1940? If your dad was involved in the retreat to St Valery he may be the last person alive who can tell me what happened to my cousin. Thanks. To Jean Jahn nee Speed: I only found out today from a friend about your question about the Speed family from Saltburn. My name is Stewart Speed and my father was Bobby Speed and all the other Speeds you have mentioned were my uncles and aunts. It has been a long long time since you made the enquiry but if you are still interested (or any of your relations) I would be only to willing to give you any information you may want to learn about the rest of the Speed family. Can anyone help me to find information about my grandad who served with the Seaforths during WW2. Name William Gordon Stokes. Don't really have much more info. Thinking of contacting the Museum to see if they can help. My father who was in the Seaforth Highlanders, and was wounded in the Somme, was sent to Invergordon to recover. Is the hospital still there? Are there any photographs or records? I would be delighted if someone could give me some info in this the Centenary year. Hi Susan, the hospital has been in Invergordon since the First World War, albeit in different roles. For example it was a geriatrics hospital from around the 1950s onwards. My mother worked there throughout my childhood. It is currently has a geriatrics ward and is used as a small community hospital as well. Nothing remains of the original WW1 buildings which were demolished and replaced with a new medical centre and hospital on the same site. Susan's father was likely in one of the military hospitals in Invergordon during the 1st WW, not the county hospital. Suggest she queries the Invergordon Museum. Thanks Ron and Harry for that info. I will keep looking! Hello I am looking for information for my Grandma. Her uncle was missing presumed dead at Dunkirk. His name was Lewis Edwards, 4th Battalion Seaforth Highlanders. The CWGC have his death as the 4th June 1940. We would really love to hear some stories or see some photos if anyone has any as we really don't know what happened to him. Last night Channel 4 showed a documentary called "Dunkirk: The Forgotten Heroes" about the ordeal of the 51st (Highland) Division in France, June 1940, ending at St Valery. It is available on More4 for the next 30 days, and is well worth watching.